We stock a complete line of quality products to build your pier or dock. We have round pine timber piling in various diameters, and in lengths of 8', 10', 12', 14', 16' 20', 25' and longer. Our piling are treated per American Wood Protection Association (AWPA) standards with CCA at 2.50 pounds per cubic foot for use in saltwater and brackish water applications, and at .80 pounds per cubic foot for freshwater immersion, and land and freshwater use. Our piling are produced in accordance with the American Society for Testing and Materials (ASTM) specifications for straightness. For over 25 years, all of the round timber piling that we produce have undergone an additional post-CCA treatment process to lock the wood treating chemicals in the wood. This process is called "fixation", and is defined by the AWPA in standard A74 under T1-16 Section G. The fixation process allows our material to be in compliance with Best Management Practices (BMP's), for treated wood designed for use in and around aquatic environments. BMP's have been adopted by the Western Wood Preservers' Institute (WWPI), and the National Timber Piling Council (TPC), a division of the Southern Pressure Treaters' Association (SPTA). BMP's give treated wood users confidence that they are protecting the environment with the most modern technology available, and are required by NOAA (National Oceanic and Atmospheric Administration) on all marine construction projects in some geographic regions. We also carry a full line of stringers and framing lumber for piers and docks. We stock both rough and dressed lumber in 2", 3", 4" and 6" thicknesses up to 12" in width. For use in saltwater and brackish water we stock stringers treated with CCA, and for freshwater applications we have stringers treated with Copper Azole. 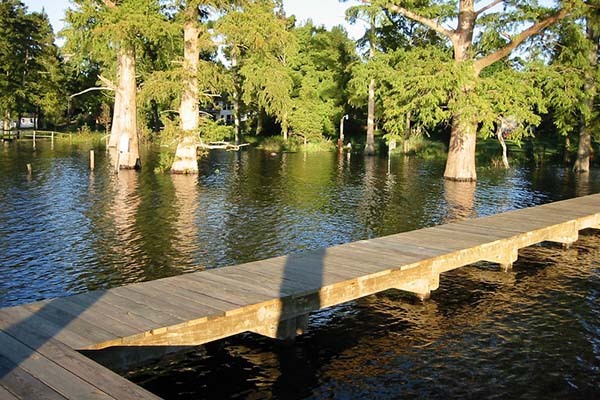 We offer pier decking in pre-cut lengths of #1 grade southern yellow pine that have been treated with Copper Azole, to give your pier deck a quality appearance at an economical price. We do not manufacture or sell any treated wood products in mixed southern pine, as we want to avoid service life problems caused by poor treatment characteristics. Unlike with the use of some competitive products, you do not need to use Stainless Steel fasteners with either CCA or Copper Azole treated wood. As in past years, you can build your marine structure with galvanized hardware that meets ASTM A 153 or better standards. We also stock a full line of galvanized nails, bolts, timber bolts and marine hardware for your waterfront project. 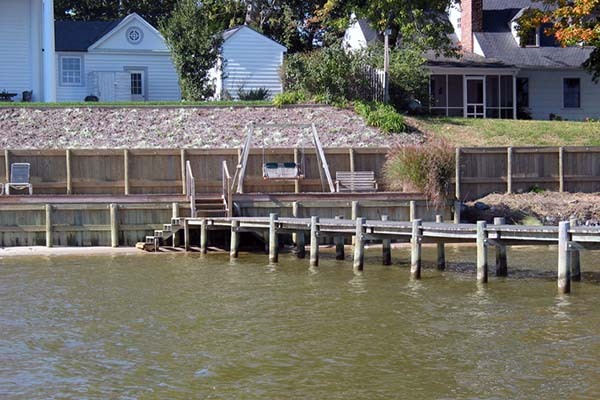 Our CCA piling and timbers are also used to protect your waterfront property from erosion in the construction of salt water or brackish water bulkheads and jetties. Copper Azole is the required material on freshwater projects. Timber bulkheads are typically constructed as Navy Walls with sheet piling next to the soil bank that are held in place with stringers and piling. The sheet piling are made of a V-Groove interlocking material with a woven geo-textile fabric between the sheet piling and the soil embankment to prevent soil erosion. We stock the woven geo-textile filter cloth in both 6' and 12' widths, and marine hardware, including tie back rods to tie the seawall back into the existing earth.